Continuing my series of strategy guides for the civilizations of Brave New World, I have now moved onto legacy civs whose strategies have changed somewhat due to the expansions' features. One civilization that received an indirect upgrade by the changes introduced in Brave New World is Dido's Carthaginian empire. Even though her actual ability didn't change, the new trade route mechanics changed the function of the harbor, which subtly changes how Carthage should be approached by Brave New World players. In the ancient world, the Phoenicians exercised near absolute dominance over maritime trade in the south Mediterranean. Phoenician control was centered in Tyre, whose colonies paid tribute but were not directly controlled by Tyre itself. When Alexander the Great destroyed Tyre in 332 BC, the Phoenician colony of Carthage began claiming control over Tyre's former colonies in Sicily, Sardinia, Morocco, and Iberia, and established itself as the commercial center of the Western Mediterranean. This economic success and naval supremacy lead to three Sicilian Wars with Greece and three Punic Wars with the Roman Republic. The third Punic War resulted in the sacking and conquest of Carthage by the Romans. Historical records of Dido are very limited, and historians debate her historicity. The sources available indicate that she was the daughter of an unnamed King of Tyre, who named both her and her child brother, Pygmalion, as heirs. But when the king died, the people refused to acknowledge Dido as heir, and only Pygmalion was recognized. Pygmalion had Dido's husband, Acerbas murdered in order to claim Acerbas' vast wealth, and Dido stole away Acerbas' gold and fled Tyre along with some attendants and senators. She landed in North Africa, where a local Berber king granted her an amount of land that she could encompass with a single oxhide. So Dido cut the oxhide into small strips and encircled an entire nearby hill upon which the city of Byrsa was founded. 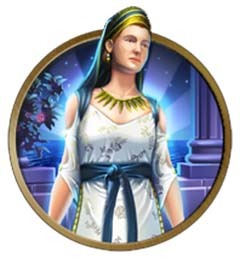 She would later also found the city of Carthage before sacrificing herself in a pyre in order to remain faithful to her deceased husband and escape a marriage proposal from the Berber King. She would later be deified by the Carthaginian people, making it difficult to determine if the stories are genuine or just legend.